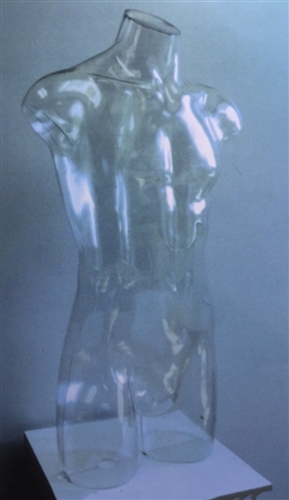 Clear Male 3/4 Torso Form make of unbreakable plastic. Available with hanging loop to display on hanging base or from face out. Also you can add a leg fitting for use on base. Made in the USA of unbreakable polycarbonate. Chest: 38.5" Waist: 31" Hip: 38.5" Height: 37"
See Hanging loop below to use with Hanging Base. Also offset torso bases with pole heights of 32" and 42". Select in options above as needed.